The day after I watched the engrossing documentary "Dior and I", which juxtaposes old footage of Christian Dior with the house's most recent head, Raf Simons, I read that Simons was leaving his prestigious job. Suzy Menkes wrote an empathic post here; if you read between the lines, she's implying Simons was burnt out, and that anyone would be, given the relentless pace of collections, PR duty, and leadership of one of the few remaining houses that does its couture work in on-site ateliers. At first I wondered, what does the resignation of an acclaimed designer have to do with the average woman, for whom a Dior label will only be attained via a lipstick? Couture counts, we are told, because this heady vision trickles down to the designer's prêt-a-porter level and eventually to the mass market where most of us buy our everyday clothes. I believe that it serves on a more subtle level, too: somewhere in the vast world of fashion, there is still a tiny world that hews to the principle of concordance with the body. While not all couturiers are thinking about how a woman will live in the clothes, Simons does not see women as walking billboards, but as active persons. ("Can she move in that shoe?" he asks a designer.) A highly-focused attention emanates from all hands; a change from white to black takes a meticulous jacket to an entirely different sensibility; the 3mm adjustment to a waistline is taken as seriously as a ten-page spread in Paris Match. When I watched models walk in Simons' Dior couture, I realized how few ready-to-wear items sold in department stores acknowledge women's bodies. Too many feature dolman sleeves that drag the torso lower than an old bra. Tees called "relaxed" are just plain boxy. Jeggings cannot replace a well-cut pair of pants, but on rack after rack, lycra has triumphed over tailoring. A number of women, frustrated with quality—especially of fabrics—have literally taken matters into their own hands. Unbreakable! 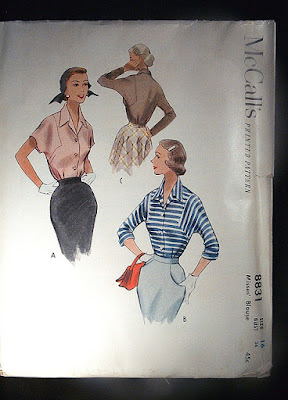 Now she's bought this Vogue pattern and is finding the instructions sparse—but knowing her, she will prevail. I find Judy as inspiring in her world as Simons is in his. The difference is, I'll get to see my friend in her creations when she's back next summer; I doubt I'll ever have lunch at the market with a woman in Dior couture! "Lycra has triumphed over tailoring." Yes, this is so true, and not just in jeggings. Women find that clothes with Lycra give a little to forgive overindulgence at the dinner table. I'm not sure that's a good thing. Maybe we were all better off when waistbands became too tight after a big meal and reminded us to compensate the next day. 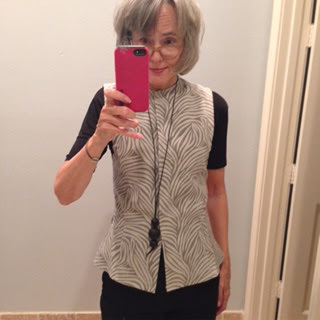 Brava to Judy for starting to sew! Her first two projects show me that she has an eye for what looks good on her. And, obviously, she likes asymmetrical lines! Good luck to her from a fellow enthusiast. She has a very good eye! One of the things I want to do when I retire someday is begin sewing again. I think with regard to mass-market clothing, the problem goes back to "good, fast, cheap...pick two". Most people are voting with their wallets for fast and cheap, and that's what retailers are providing. Sewing: Great point! When I was in Weight Watchers they told us to get rid of (and not buy) anything with elastic waists. I was truly amazed in my latest tour of a good dept. store, how few pants were not stretch fabrics. I have nothing against 1-2% lycra in jeans, but when used in knits, the pant bags after just a few hours. unefemme: I recently chatted with two young women in their early 30s who think it's perfectly natural to replace their wardrobes every year- they buy from places like H&M but also secondhand. The thing for them is change, the thrill of new stuff. They were politely aghast that I was wearing a pants and a sweater I've had for at least 6 yrs. (For them there was only one reason to not buy new season after season: no money.) One asked me how much the sweater cost and said she would never spend that because then she would have to wear it a long time, and that was seen as a negative. What wonderful results for a first two projects, and this is obviously not beginner's luck but the result of intelligence, persistence, care, and, as Sue says, a very good eye. I'm also hoping to get back to sewing, now that I theoretically have more time for it. But I'm also slowing right down in the acquisition process, thinking more about what I really need and want. And what I don't want are quick copies of runway hits, made for the generic body and therefore inclined to make me feel dissatisfied with my own . . .
Duchesse, I was surprised that the young women who expressed horror at your "old" clothes were in their 30's. I'd expect that attitude from 20-somethings. Isn't it ironic that they will buy second-hand but look askance at someone who's still wearing clothes of the same vintage? You friend's pieces are wonderful! And now we see, of course, that Lanvin has shed Alber. Another person who designed for women's bodies rather than the flash and glare of Instagram. Very, very interesting. I love documentaries about the fashion world and now you've shown me another to borrow from the library, thank you. Sewing is something I used to do but I never felt satisfied. There is a high level of skill and experience needed to produce a really well fitting result. Don't think I'll be returning to it, you need a fair amount of space, a good work surface, etc. and my time and energy goes in other directions now. I'm buying less these days, just don't need anything more after building up a new wardrobe over the past few years. Your chat with the younger women took me aback, this is so far removed from how I've lived. Thinking of longevity, one pet peeve is the synthetics used for most shoe soles now, very difficult to repair or replace and I was brought up to mend a good pair of shoes, not throw them away. LauraH and Sewing: They were 31-32 but (you have helped me to reflect on this) the key thing is, single. It's a whole other world when you're buying shoes that a child outgrows every time you turn around. materfamilias: I am surprised to see inferior finishing even in clothes that are not cheap; this is probably more irksome even than 18-inch skirts! But sewing takes a lot more space than knitting, and is not portable. My DIL has her own studio, very lucky. LP: At the couture level the client can specify more coverage, but when designers who have a sense of grace leave a house, the default is the flash-trash of Balmain- horrible. Regarding clothing with "give," I have to say though that as someone who works full time at a desk job, I'm grateful for a little bit of stretch; anything fitted and without give gets horribly uncomfortable after a few hours of sitting. I never understood the art of couture until I saw "Dior and I." The entire house gives birth to the vision of the designer and each person adds a bit of him/herself to the collection. It was a truly enjoyable documentary. Your friend has a talent for matching material to design. This was something I could never do when I sewed. The results were often awkward and amateurish. I wish I had your friend's eye. 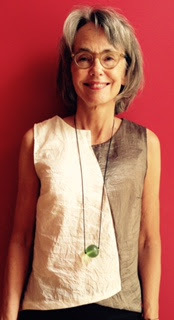 As she becomes more proficient with the technical aspects of sewing, her creations could be quite amazing. Dior and I is going on my queue today; thanks for the recommendation. I've been sewing clothes most of my life. And yes, you need a "studio" that not only includes space to sew and cut out(a dining room table works but creates clutter...) but store the "stash". My point is that garment sewing must be a passion, otherwise it's too time and space consuming! These days I concentrate on garments that fit into my relaxed, southern California, retired lifestyle. I enjoy well fitted garments, high quality fabrics and the satisfaction that what I'm wearing I've made myself even if it's a simple everyday outfit. BTW, my DD is 26 and on a budget, but stays away from fast fashion, preferring to buy secondhand or fewer, made in USA items. une femme: That's so true about sitting with no stretch! What I was referring to is the takeover of jeggings, which read like very heavy tights. Way more stretch there than the low percent of lycra in stretch wool or woven cotton. I love tailoring, but not the traditional menswear blazer (on me). Kristien62: Wasn't that a wonderful moment when his mega-cute "right hand" associate says, "I only want to do couture now"? Nelson Bartley: Leather! We would love to see that! Good for you. My sewing history is like yours; finally, after wrecking some efforts, I quit except for some craft projects (like felt Christmas wreaths) that did not have to fit. Unknown: For both Judy and other readers, thank you for your generous sharing of resources. I admit to lurking on sewing and fabric sites. If I had more room I might tiptoe back in, and so admire your ability. Kathleen Blackmur: I am delighted to see sewers commenting! My DIL just moved into a new apt. with a room just for her sewing. She buys clothes at Goodwill, etc. and rips them apart. Some will be sold soon on Etsy, others are sold to benefit a women's shelter. She drafts many of her own patterns, too. Enough proud MIL boasting. As an avid sewer till about my mid-30s, I know all about stashes and the allure of a great deal on an end cut... •still• have some fabric. You will swoon when you see what they are doing in the film; of course all by hand! Duchesse, please share when your DIL's creations go "live" on Etsy! LauraH: Stashes are more than mere fabric, you can chart your memories: that jumpsuit for a New Year's Eve party, that dragon print for an ex-boyfriend's shirt, the stripe you bought for a quick skirt and then realized oh no, it has to be matched, so there it is,ten years later, untouched. I think there is a special art to buying and actually using everything. Kathleen: Very kind; I will. A belated thank you for all your wonderful posts--window shopping, flaneur, etc. As a city person who's never actually lived in a city for more than a few weeks, I love your Montreal posts. We are thinking of a visit in July--it's a few hours from our vacation destination. As someone with almost no waist--and what I have is very high--I must speak out in praise of lycra and stretch waistbands. I spent many years in physical misery. Wide stretch waistbands--and tops untucked--ahhhhhh. Frugal: When I read blogs, women are always wondering how to be chic. (Hint, it is not with elastic waists.) But at the same time, we want to be comfortable; that's the paradox! I think the answer, or one of them, is to have pants that are well-cut, with waistbands that dip slightly and are big enough. (Many pants are 'ultra-missy', cut for bodies with not much hip, and small waists.) Women (not you, Frugal) also like to squeeze into that one size smaller and then wonder why the waist digs in. But it is so much cheaper for manufacturers to substitute stretch for real tailoring. I am not immune from the siren call of the yoga pant, so comfortable. Your friend has a good eye and knows what works for her, both advantages, as well as the interest and will to follow through. Thank you for sharing and good luck to her. Liked your friend's blog... I also have a friend who is Argentine, and since getting her OAP pension, spends the austral summer down there, and the boreal summer up here. She had a small inheritance that paid for a little flat in residential buildings owned by her family - dad had a small hotel and restaurant. I'd much rather be able to always avoid winter as well. Working on that. I do think more attention has to be paid to the fact that people are not only all different sizes, but also very different shapes. Go Judy! I love her ambition. Very inspiring. Here's an interesting post on the 9 common female body shapes. No wonder so many are uncomfortable in their clothes, Lycra or no! water: Thanks for linking us to this detailed description. (Once again body-shape categories make my eyes cross as I flit among descriptions trying to hone in. Such consideration is essential to sewers and anyone wondering how to untangle fit issues.) Body type is needs to be considered along with other dimensions, such as, does a person have shapely legs, or less so? 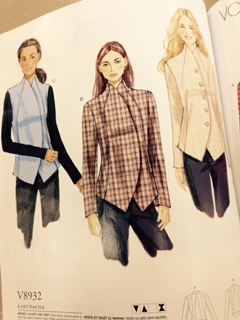 Sloped or square shoulders? A high or low bustline? We have not only different figures, but differently-shaped features.